Immediate results allow the doctors to formulate treatment plans during your pet’s appointment without having to wait for the sample to be sent elsewhere. Should your pet require additional testing or medications, you will not require a second visit. If your pet is ill, this allows us to provide care quickly to help get them on the road to recovery. Pre-Anesthetic testing can be done the same day as your pet’s surgery which eliminates the need for your pet to come in separately for a blood collection. Pre-Anesthetic testing reduces the risk of anesthetic for your pet, detects hidden illness and provides us with a base line for future reference. We have the ability to customize the testing your pet will receive based on your pet’s needs. 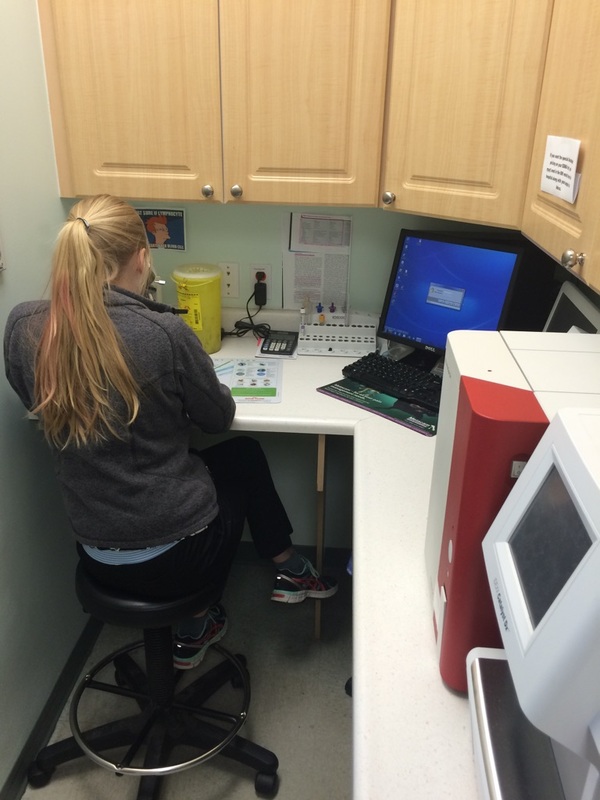 Our analyzers allow us to do a complete blood count, up to 17 different blood chemistries, and check electrolyte and thyroid levels. We can also do more specialized testing such as Phenobarbital levels to adjust medication doses, Urine Protein Creatinine Ratios to look for protein loss through the kidneys, and Feline Infection Disease testing looking for FIV or FeLV. We are also able to perform urinalysis’ in hospital allowing us to check for urinary tract infections, cystitis, and crystals in the urine. A urinalysis may also help to assess how your pet’s kidneys are functioning. 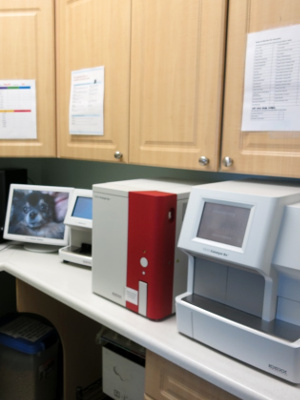 Our analyzers allow us to track trends in your pet’s bloodwork which we can then print for you or email to you so that you have the most up to date records of your pets internal health. This may be helpful if you are monitoring your pet’s kidney or liver function as they age. We are able to get the advice of the Idexx Internal Medicine team on any particularly difficult cases that have bloodwork run in house. This means you get the same quality interpretation whether you sample is run in house or sent out to the lab. Would you like some more information about bloodwork? Any specialized testing that we cannot run in house is sent to Idexx Laboratories where they have board certified clinical pathologists who can quickly and accurately interpret your pet’s blood results. Stat evaluation of bloodwork is always available.